* 100% Stainless Steel Grill Grate. You’ve got friends over for a big backyard bash. The ribs and wings have been marinating for days. The ribeyes are stacked and ready. The beers are on ice. The charcoal is lit. But then the race against time begins. Get the meat on too soon and it’ll be engulfed in flames and cremated. Leave it a few minutes too long, and you’ll be left with half the food uncooked on dying embers. Simply spin the grill grate counter-clockwise, and Grillup® extends two inches abover the rim, which means you can keep the meat far from the coals when the fire’s fiercest. Turn it in the other direction, and you get close to the fire towards the end. 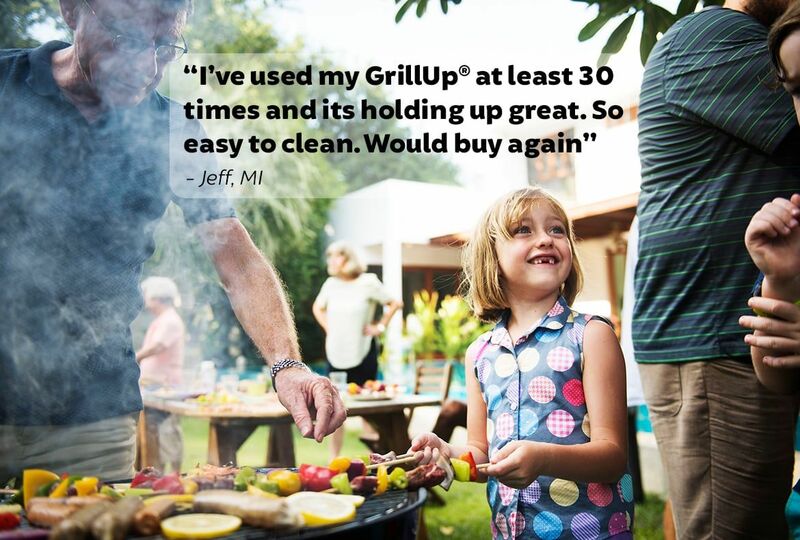 GrillUp® lets you grill to perfection, slow cooking when you want it, or getting that crispy char your guests love with an effortless twist. Get a GrillUp®. Take control. We men are never happier than when we’re out back grilling. There’s something primal about fire, meat and the open air. So here’s a gift idea that’ll give your man a little edge when he’s out there with his mates. GrillUp® is an innovative barbeque grate that fits any round 22” kettle barbecue. There’s nothing to install. You take it out the box, screw in one screw and put it in the barbeque. Give it a twirl counter-clockwise, and you get two inches of extra height above the standard Weber grate. Twist it clockwise and it lowers all the way down to the coals. That means you get up to an hour extra grill time for those big occasions when there’s a lot of barbecuing going on. It’ll help your guy avoid the embarrassment of burning the ribeyes when the coals are too hot. It puts him in control. And it’ll all be thanks to you. GrillUp® is made of 100% 304 stainless steel and it’s built to last. And for less than 80 bucks, it’s the perfect gift for the man who has it all..
See The GrillUp™ in Action.